“CNC machines are more accessible than ever, with the large range of cheap CNC machine kits from China. The most common type are the 1610, 2416 or 3018 types, referring to the dimension of their machine bed. While they are great machines for their price, their performance is not that terrific. 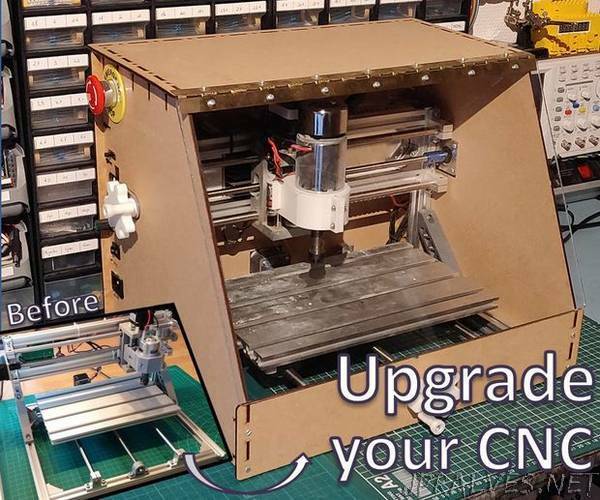 With a few upgrades however, the quality and safety can greatly be improved to turn it into a very potent CNC machine! Adding safety features Upgrading the spindle to cut aluminium Adding bluetooth control Adding an enclosure Adding manual controlWe will start this guide with an assembled CNC kit. There is enough documentation already for the assembly of these kits, so I will focus on the upgrades only. Most upgrades will be 3D printed. The necessary files are included in each step, as well as a wiring diagram. Besides a 3D printer, we’ll also need a soldering iron and some basic tools.